Greenies Weight Management Canine Dental Chews, formerly Greenies Lite, are nutritious and calorie friendly specifically formulated to help promote dental care while providing essential vitamins, antioxidants and minerals in dogs 15-25 lbs. Greenies Weight Management Dental Chews are naturally made with added vitamins, minerals, taurine, and chlorophyll (sodium copper chlorophyllin) to provide a complete oral care, and offer a nutritionally complete and balanced blend of highly soluble and digestible proteins for adult dogs based on AAFCO recommendations. Greenies Weight Management Dental Chews are clinically proven to clean dog's teeth by fighting both plaque and tartar buildup, freshening breath and maintaining healthier teeth and gums. 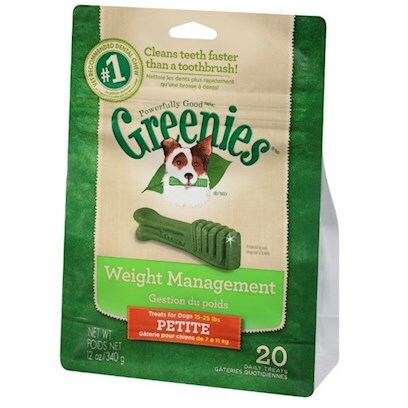 Greenies Weight Management Dental Chews are specifically formulated to help clean dogs' teeth while also allowing you to keep an eye on his weight. The blend of high-quality proteins fortified with vitamins and minerals make Greenies nutritionally complete and balanced for adult dog maintenance. And Greenies Weight Management Dental Chews also contain natural sources of antioxidants for a healthy immune system as well as the addition of vegetable and fruit inclusions. Rice flour, gelatin, glycerin, wheat flour, hydrogenated starch hydrolysate, oat fiber, apple pomace, tomato pomace, natural flavor, soy protein isolate, wheat protein isolate, vegetable oil (preserved with mixed tocopherols), lecithin, barley flour, pea flour, sodium caseinate, ground flaxseed, minerals (magnesium amino acid chelate, calcium carbonate, zinc sulfate, ferrous sulfate, copper sulfate, manganese sulfate, calcium pantothenate, potassium iodide), vitamins (dl-alpha-tocopherol acetate [source of vitamin E], L-ascorbyl-2-polyphosphate [source of vitamin C], vitamin B12 supplement, niacin supplement, vitamin A supplement, riboflavin supplement, vitamin D3 supplement, biotin, pyridoxine hydrochloride [vitamin B6], thiamine mononitrate [vitamin B1], folic acid), potassium sorbate (to preserve freshness), choline chloride, taurine, carotene, chlorophyll.